Known for Pakistan General 4th Commander-in-Chief of Pakistan Armed forces (1958-1969). Governor of = West Pakistan and Baluchistan. General Musa Khan Hazara H.Pk., HJ, HQA, MBE, IDC and PSC (موسى خان) (1991-1908) was the Commander in Chief of Pakistan's Army. He succeeded Field Marshal Ayub Khan, who assumed the Presidency of Pakistan. He was the eldest son of Sardar Yazdan Khan, born in a Hazara Shia Muslim family in Quetta, he was from the Sardar family of the Hazara tribe in Balochistan, Pakistan. He was a Naik (Junior Non-Commissioned Officer) in the 106th Hazara Pioneers and went to the Indian Military Academy in Dehra Dun as a cadet and graduated with the first batch of the British Indian commissioned officers on 1 February 1935. He was posted to the 6th Royal Battalion,the 13th Frontier Force Rifles as a Platoon Commander in 1936. He took part in the Waziristan Operations in 1936-1938 and in World War II, where he served in North Africa. 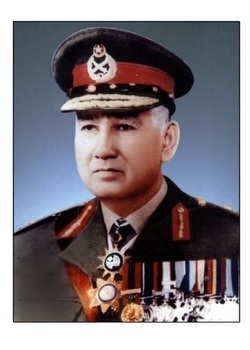 General Mohammed Musa commanded the Army in the Indo-Pakistani War of 1965, and had overall responsibility for operations throughout the conflict. As Army Chief, he was criticised for not anticipating an assault across the international border. However he was given credit for blunting the Indian offensive towards Sialkot during the Battle of Chawinda. He has narrated the events and experiences of the war in his book "My Version". In the book he has given accounts of the secret war that was going on in Kashmir between the two countries, long before the real war actual began. General Musa Khan is the author of his autobiography, Jawan to General in which he describes his lifetime experiences from a simple foot-soldier rising to become a general. Following Col. Mehdi's articles on the 1965 war, there has been an expression of interest in this momentous event as can be seen from the letters which appeared in this columns. In my opinion, the 1965 war bred the 1971 war and is thus an important contributory cause of the latter and the tragic events that have followed the conflict. Is it not time that a full-fledged inquiry was held into the causes, the conduct and the consequences of 1965 war? Mian Arshad Hussain had excellent reasons to demand a probe into the concept, conduct and consequences of 1965 war' as he was Pakistan's High Commissioner at Delhi during that fateful period. He sent a warning on 4th September 1965 to the foreign office of Pakistan through Turkish Embassy that the Indians were planning to attack Pakistan, on 6th September. Mr. Aziz Ahmed, Pakistan's Foreign Secretary through a press statement acknowledged that such a warning was indeed received by the Foreign Office. But the debate on this warning issue' remained inconclusive, in that Aziz Ahmed maintained that the warning was received two days after war had already started! Only probe by a high powered judicial commission can separate shadows from the substance.